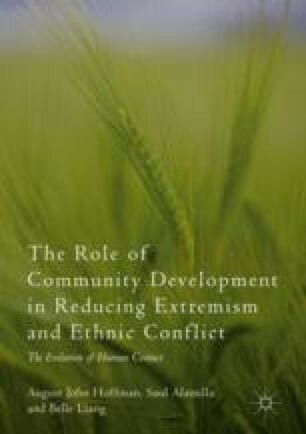 This chapter will explore the efficacy of specific forms or types of community service intervention programs and volunteer activities in the development of community resilience and recovery from natural (i.e., hurricanes and floods) and human-related (ethnic genocide, terrorism) disasters. The therapeutic role of community gardens and urban forestry programs will be examined in four different post-disaster scenarios: the 2012 Sandy Hook Elementary School shooting, 2005 Hurricane Katrina, post-9/11 recuperation efforts, and the 2016 Orlando nightclub shooting. Environmentally sustainable and “green” activities that utilize the efforts and skills of community residents are addressed as effective methods in helping communities recover from various types of violence and extremist activities. The psychological and physical benefits of “Victory Gardens” and memorial gardens, green spaces, urban forestry programs, and community gardens are examined as effective programs in helping communities cope with various forms of disaster.